I've completely given up on Big Brother - I watched it for a long time, but really, it wasn't good for my blood pressure. I can't believe I watched it for as long as I did. 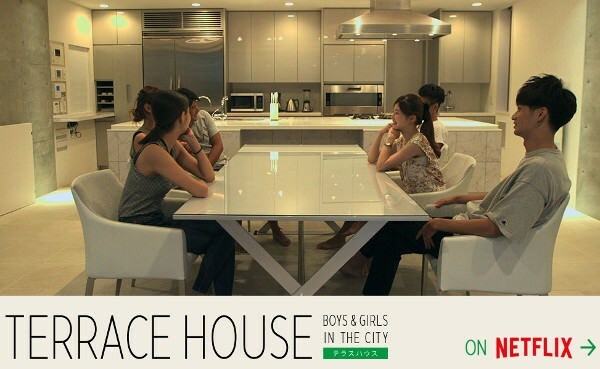 But we've found the perfect replacement for it on Netflix: Terrace House! It's a Japanese reality TV show, where 6 young people, three boys, three girls, share a house, and a panel of TV presenters discuss what's going on, or not going on, as is more often the case. The six young people take it very seriously. Most of them are looking for love, but some have to leave love, and the house, behind, in order to pursue their studies or careers, which always seem to be the most important thing in their lives, except for one chap who was living in Hawaii, and was so laid back he barely had a pulse. It was fascinating to watch, as Japanese culture is so different from ours - how long it takes to get to a kiss, how dates are conducted, how the girls always seem to have the power when it comes to deciding where they want the relationship to go, how little people touch, and how important hard work is to everyone. They even have house meetings to discuss how they feel about someone's behaviour (doesn't clean enough, makes too many disparaging comments, etc. ), and the conversation generally ends with the person promising to try harder, work harder, amend their ways. It's on Netflix, and the next season, starting soon, will be set in Hawaii. That will be interesting! Well, I was wearing these clothes around Christmas, but I didn't get around to posting the pictures, so there you go! It's a couple of months since I saw this movie. But it was good. So I wanted to tell you a little bit about it. 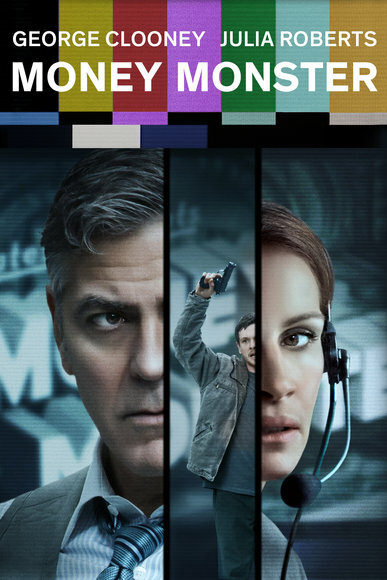 Georges Clooney is the presenter of a TV show called Money Monster - he analyses the markets, gives tips on investments, all in a manic, tongue-in-cheek, kind of way. Julia Roberts is the producer of the show. Jack O'Connell is a young man who lost all the money he had, which wasn't much, because he followed Clooney's advice. He's not happy. Well, actually, he's very angry. And he's not blaming himself. It sounds formulaic, but, in my opinion, it works. And I think Clooney and Roberts have fantastic screen chemistry, even though they are barely ever on stage at the same time. The only finished sketch I managed to complete - January in Venice, although sunny, is very cold! My initial proportions were not bad, but I misjudged the length of the building to the right. Still, I really enjoyed sketching this! So, here are three I tried out. Some of these people are famous. But I'm not sure I've got the likeness. Yet, I'm quite happy with how they turned out. Reducing the number of lines and squiggles seems to be the answer I've been looking for. I must look for instructions on how to draw hands. The thing I love about Liz Steel's advice is that it's all about sketching quickly! Which suits my busy life! The next exercise in Lesson 6 was an outdoor prompt: drawing roofs. A scary thing, roofs, all angles and volumes! I tried two different methods. The first one is ink first, then watercolour. And the second is the opposite. Because the ink I have in my fountain pen is water-soluble, it bleeds when watercolour is applied on top. But I quite like that, as it helps me apply darker tones and textures. Experienced sketchers use waterproof ink, but it will block your fountain pen if you don't use it regularly, so I'm not sure it's for me. I've ordered some de Atramentis ink online and I'll try it out when it gets here (and no, I didn't buy any of their scented inks - peach, strawberry, apple, green tomato? All too strange for me). It's supposed to be waterproof without clogging fountain pens. Which sounds like an oxymoron to me, but I'll let you know how I get on. A friend had recommended the Turner exhibition at the National Gallery, and I'm delighted I went. 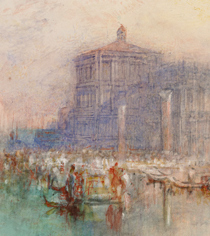 I can't believe I've lived in Dublin all these years and I didn't know about this - every January, the gallery shows a collection of Turner watercolours that were bequeathed to it in 1900 by Henry Vaughan, with the stipulation that the works only be shown in January, to protect the watercolours from strong light. There are a few gems in this collections. Plus it was really interesting to look at the paintings up close and get a sense of Turner's techniques - and yes, there were even some paintings where he used gouache for highlights! Another attempt at fitting sketching into my life. The hairdresser's. I've started colouring my own hair again, because they could not get the exact vibrant colour I wanted, but also because it all takes sooooo long. Mind you, I was waiting nearly half an hour before the stylist was ready for me, even just for a cut. But I didn't mind. I had my sketchbook with me, and I drew what I could see in the mirror: me, my cup of green tea, another customer, and my hairdresser, both from the back and his reflection in the mirror. 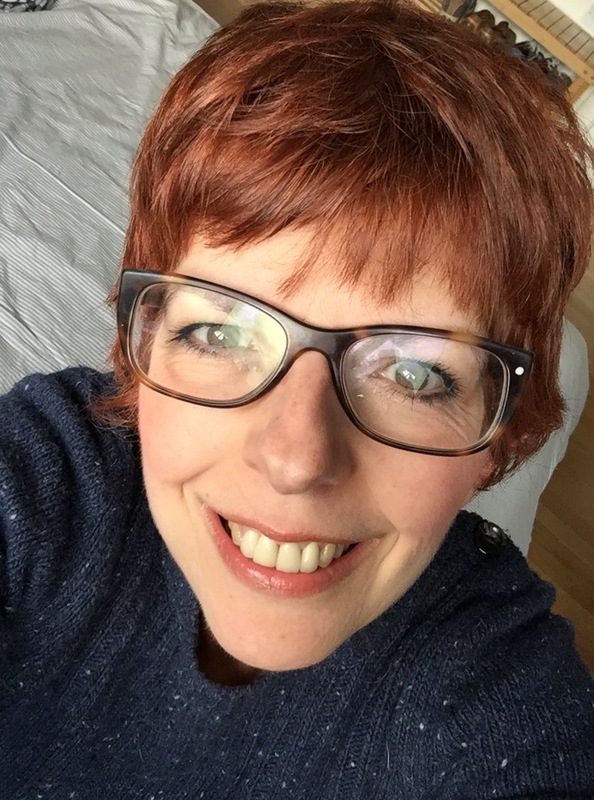 I haven't taken a picture since my hair was cut, but here is the new colour. It makes me feel young again (don't look too closely)! He thinks I made him look like a Ross O'Carroll Kelly book cover! Maybe. Still, it's all part of my effort to fit more sketching into my life. So, rather than watch television, I picked up a big A3 sketchbook I've had for 12 years, and I drew the perfect subject, sitting right beside me, while he was absorbed somewhere on the web. Maybe it's the new year. Maybe it's the weather. Maybe it's looking at a video from Sketchbook Skool . I'm trying to finish a course, Storytelling, that I started ages ago - some of the instructors didn't inspire me much, but rather than doggedly completing every module, I jumped to the module taught by Veronica Lawlor, and I felt a sense of renewed energy for drawing the human form. What she may have lacked in didactic skills, she more than made up in passion and enthusiasm. In art, it's not so much about teaching you how to draw the perfect hand, but more about encouraging you to try it again and again, until you succeed. In a video I watched, Danny Gregory compared it to young boys playing video games, where they "die" many times before they figure out how to get past a particular obstacle or get to the next level. The same thing applies to your art practice. If you "die" the first time and never pick up your pencil again, well, you'll never move beyond that point. A philosophy best summarised as "Just do it!" Which I'm embracing this year so far! I did a few more sketches while he was preparing dinner. I will get better at this, I'm determined! Lips and hands will require some attention! First Sketchers session of the year! It's nice to be getting back into a regular routine. As Hugh Lane was the location that was picked for today, I dropped over to the Olivier Cornet Gallery on my way to look at their current show, Élévation, a wonderful group show. A great way to get a feel for the gallery artists' works. It took me a while to get settled - I started with a new sketchbook, a small square Derwent Grafik book, so that always takes a little while. The good news is that the paper is very easy to draw on. But it doesn't really allow for drawing across the whole spread, as the paper is different on the verso, and there is an easy-tear line. I tried a couple of room sketches with people, using a technique I had just read about in one of my Christmas presents (I always get art books for Christmas) - the tip was to anchor the scene by drawing the walls and floors before starting on people. And if people move, to go back to the anchor, and do a bit of work on the ceiling or the paintings on the walls until someone else moves into place. Then I went upstairs to have a look at the Michael Kane exhibition, and I found a lovely quiet little room with a beautiful fireplace, and I knew that was my drawing for the day! And I even used what I've learned from Liz Steel's Foundations course: I actually did a quick measurement with a watercolour pencil, to make sure the proportions were right. And that was my assignment for Lesson 7, so I can now progress on to the next lesson! A few attempts at sketching my husband and my dog. Hands are hard. I had hit a block in Liz Steel's Foundations course at Lesson 5, Measured Setup. I guess I discovered what I knew already: I don't like measuring. I really don't get this pencil thing. And when I use it, the resulting drawing always looks wrong. Of course, that might just mean I need more practise. But life is too short to practise something I don't enjoy! So I was glad that Lesson 6 was all about finding the minimum amount of measuring that works for you! In my case, very little, it turns out. And I also discovered something else I already knew about myself. I love bags!! Quick gestural drawing with a light watercolour pencil, just to get a feel for the proportions. Carefully drawing in ink. Ignore the pencil lines if they are wrong. They're just there as a foundation. Another method, which is the best for me: no pencil, straight to ink, starting with important edges, and working from edge to edge, carefully feeling your way around. I couldn't resist giving you a larger version of the same. The little clutch bag in front worked out well, I think. It was a complete impulse buy, that I will probably never use, as I have no matching dress. But it wasn't a waste, as it found its way into this drawing! And a final method, which I didn't like as much: no ink, just watercolour pencils and watercolour. And a larger version of the same. Just because it's one of my favourite bags! There will be no nudie pictures in this post, don't worry! Onsens are Japanese hot springs or spas - the big difference from what we're used to in this part of the world is that you are required not to wear any clothes. No bikinis, no knickers, no bra. No need even to modestly hold a towel in front of you! I thought it would take a little getting used to. But after one session, I was an expert! Thanks to my good friend Shinobu who thought it was the most natural thing in the world to go to an onsen with a friend! So that's the best advice I can give you: bring a friend who knows the ropes with you the first time you try an onsen (even if the idea is a bit scary). And also, remember to wash and rinse thoroughly before entering the hot baths. Japanese onsens are said to be good for you, a bit like taking the waters, as the hot waters are of volcanic origin and contain a variety of minerals. I didn't feel different. I didn't glow. But it was fun, and very relaxing. Although, careful if you suffer from high blood pressure. Don't stay in the hot water for too long. One of the best things about onsens is that they often have both an indoor pool and outdoor baths. So you can experience the coolness of the air and the heat of the water at the same time. Onsens nowadays are segregated, so you can't go in with your husband, unless the place you go to has private baths. Which our ryokan in Hida-Furukawa, Yatsusankan, did. So, now that I was an expert, I got BB to try it out too. And I even went to the onsen in our ryokan on my own the following morning. Now that I knew the ropes, it was no big deal. It wasn't busy. And the ladies who were there already had a few words of English to make me feel welcome. And an elderly lady even started chatting to me in the changing rooms, engaging me in full conversation in Japanese. Not that I understood much of what she said. But enough to get by and keep everyone happy. Remember, smile a lot. And don't stare. I'm practising sketching people. From photographs until I build up the confidence and techniques to achieve a likeness. Here are two I drew recently! The wording on the back of this photo is: "Le jour où MaLouise était passée dire à MonRené qu'elle ne voulait pas se marier! - 1944"
You wouldn't think of me as a bread maker, now, would you? I wouldn't think of me as a bread maker! But a food program on Netflix, called Cooked, that I saw months ago, had put the idea in my head. Did you know that home-made bread requires three ingredients? Shop-bought bread: 30+. So maybe it's not gluten that so many people have an intolerance to. When a dear friend offered me 100g of her sourdough starter, I jumped at the opportunity. I had to keep it in the fridge over Christmas, as I wasn't going to embark on this adventure with an audience. But as soon as our guests were gone and my cough was manageable, on the 27th, I got started. My friend had also sent me a link to the perfect recipe/schedule for making sourdough bread, so I was all set. This recipe has 4 ingredients: flour, water, salt and olive oil. 5 if you count the "starter", i.e. the bubbling dough that is the essential starting point for making bread. And I was so lucky! The first time I tried it, everything worked out perfectly and the dough felt and looked good. It felt alive and springy. The second time, I think something went wrong with my weighing scales and I had to add a good bit of flour (or maybe it was just a different flour? ), but I knew how it should look and feel and I was able to adjust my ingredients accordingly. Both times, perfect bread. Best eaten an hour or two after it comes out of the oven of course. If you want some starter, let me know. As it needs to be "fed" once a week when it's kept in the fridge, I have plenty on offer! The water test! If the fed starter floats in a glass of water, it's time to make the dough. If it sinks, it needs to be fed again (equal weight starter, wholemeal flour and water) and it needs another few hours to rise. Dough is starting to expand. Ready for the oven. Using a LeCreuset dish (I don't have a Dutch oven!). I should have sprinkled more flour on the bottom of the dish. The first bread stuck to the bottom a bit. Just out of the oven. 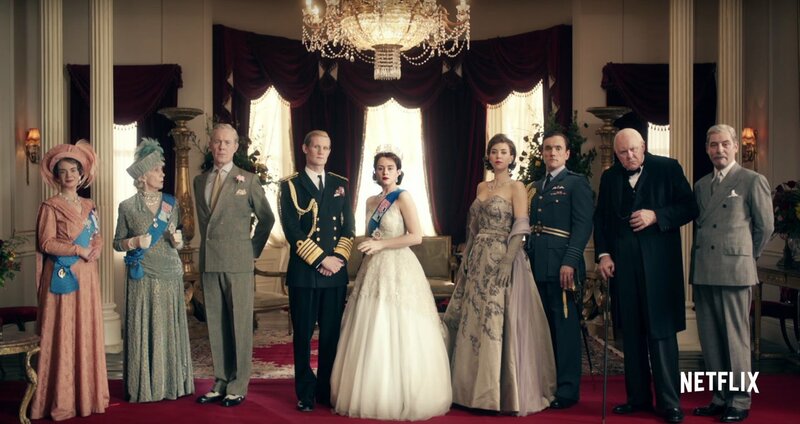 The Crown: we'd already started watching this series about Queen Elizabeth II's early years as the monarch, but we binge-watched the final episodes. I read somewhere that this TV series is the best PR the British Royal family could get. It was fascinating. And very sympathetic towards Elizabeth - how she had to let go of her normal life to become an institution, how everyone seemed to have their own agenda that they wanted to force on her: the prime minister and the government, her private secretary, her grand-mother, her mother, the Church, her husband, her sister. A really interesting period in history. And the dresses are gorgeous too! Excellent performance by Claire Foy, who played Anne Boleyn in Wolf Hall! 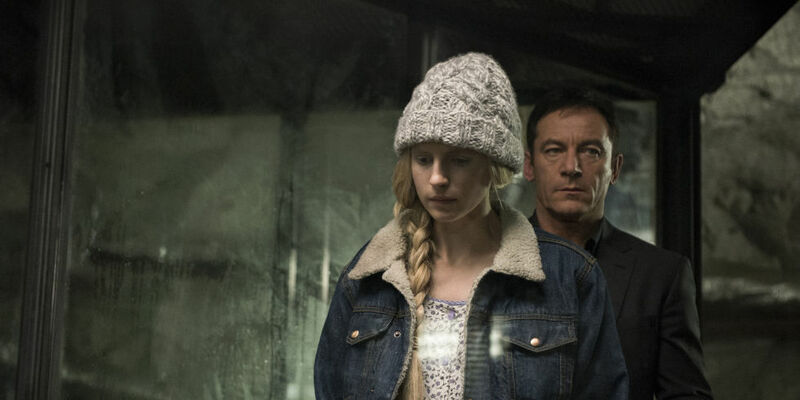 The OA: I don't know why The OA has been compared to Stranger Things? No cute kids. No monster from another dimension. Just a young woman who disappeared seven years ago. And she reappears. And she's no longer blind. And she won't tell her parents or the FBI what happened. But she comes across 5 misfits from the local school, and she starts telling them her strange story. And what a story it is. I love Brit Marling. She always comes up with interesting projects, like Another Earth. And of course, a perfect cliff hanger at the end of Season 1! I often find that the paintings I do as "just a quick sketch" work out the best. For this one, I grabbed a sheet of cheap watercolour paper (I've got a block of 100 pages - no excuses! ), didn't even bother to stretch it, and I started working quickly from a photograph I dug up from my collection. The view is just off the main road between Montséret and Saint André de Roquelongue in the Corbières. I'm still exploring a technique I learned on Marc Taro Holmes's class on Craftsy. And on this occasion, the brush pen I used for my darks is a gorgeous pen I bought in Japan. The only branding I found on it is "akashiya", and all I knew when I bought it was that it was a brush pen, and that I really wanted it because it was so pretty! What I didn't realise of course is that the ink is water-soluble, so it's to be used with caution if applying watercolour on top of it. I thought my little painting was going to be ruined when the black of my trees started to bleed into the pink sky. But we survived. And I'll know for again. #OneWeek100People2019 Comes to a Close!